A group tour of enormous scope, travelling with expert local guides from Santiago to central Chile, then to Tierra del Fuego and back up to Buenos Aires, covering Patagonia's best trekking in a series of day hikes, visiting volcanoes, touring the exciting cities with chances to river raft, ice hike and sail the Beagle Channel. Those arriving on an international flight will be met at the airport by the tour leader or a local representative. There will be time to relax before exploring the city and visiting a few of the many museums, markets, and parks of this cosmopolitan capital. Santiago is laid out in a broad valley below the snow-capped Andes. For a panoramic view over the city, visit Cerro Santa Lucia, a central, rather romantic park. For even more panoramic vistas, a cable car leads to the summit of San Cristobal, where you can join Chilean families wandering along the leafy paths. Afterwards, have a beer at one of the pavement cafes in Bellavista. This is an Italian quarter of narrow streets peppered with bars and shops selling local lapis lazuli (only Chile and Afghanistan produce the stones in commercial quantities). 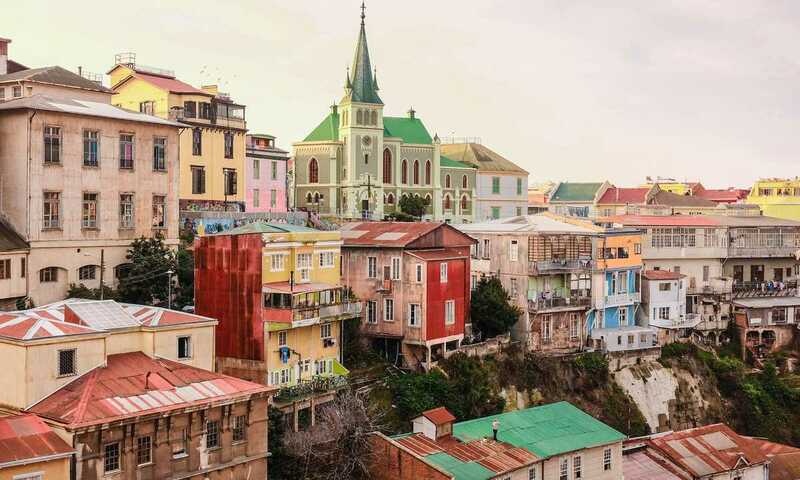 Today there is an optional visit to Chile's second city, Valparaiso (2 hrs by bus). This lively seaport is built on a series of hills which form a backdrop to the wide bay, with views over the seaside resort of Vina del Mar. You can wander through the steep, winding streets and among the brightly-coloured colonial homes built for 19th century British and German merchants, or take a ride in one of the creaky wooden funiculars which link the cliff-top communities. Time permitting, you may wish to visit one of the vineyards close to Santiago, to sample some highly respected Chilean wine. Fly south to Temuco; continue by bus to Pucon, leisure capital of the lake district. Located on the shores of Lake Villarrica, Pucon is a popular summer resort overlooked by the dramatic peak of the active Villarrica Volcano (2,840m). During your free time here, you might hire a bike and follow undulating trails into the forested countryside, stopping off at waterfalls, volcanic lakes, and natural thermal springs. For something a little more adventurous there is the option of river rafting: gliding across the extraordinarily clear, glacial waters between densely-forested banks, and with a towering volcano as your backdrop, is a wonderful way to see the countryside. The river has grade 3/4 rapids, but no previous experience is necessary if you wanted to join a rafting tour. Today offers an excursion is to Huerquehue National Park: follow trails through the mature araucuaria (native monkey puzzle) forests, passing glossy lakes. It's an idyllic, almost fairyland landscape, with buckled roots, vines, and creepers. This full day's walk (5-6 hrs) is quite challenging with some steep sections. There is also the option to climb to the icy peak of Villarrica volcano. This is a demanding trek which requires a good level of fitness. A local agency provides all the necessary equipment. The steep 1,400m ascent takes 5-6hrs through snow and icy conditions. Views down over the surrounding volcanoes, shimmering lakes and bright green deciduous forests are mind-expanding and at the top, you are greeted by the sight of the deep, smoking crater. Or you might explore the area on horseback. This is a 4hr optional trip into the Mapuche countryside originally settled by the Mapuche indians in the shadow of Villarrica and Lani-n volcanoes and along the shores of the bright green Curilafquen Lagoon. You can even take a dip in the chilly waters if you dare! A morning bus takes you to Puerto Varas, situated on the shores of Lake Llanquihue (one of the largest natural lakes in South America), in the heart of the lake district. Towering snow-capped volcanoes punctuate a patchwork landscape of cultivated hills and pastures. The town sits in the shadows of the perfect conical peak of the Osorno and Calbuco volcanoes. There is time today to wander around the town. Originally colonised by German immigrants, it has a distinctive, Bavarian feel, and many inhabitants are fair-haired and blue-eyed. There are some excellent seafood restaurants and cafes to while away a day at leisure. Alternatively, we strongly recommend a full-day excursion to Chiloe. This extraordinary island developed largely independently from the mainland and has a distinct history, architecture, and mythology. Alighting on its shores is like stepping back into a time of mists and legends. Half the population works in agriculture, the techniques of which have remained unchanged for centuries; distinctive ox-driven carts are to be seen trundling down the island's unpaved roads past unique wood-shingled churches and there are several folksy fishing ports where you can savour fresh oysters. November-March you can take a boat trip to spot Magellanic and Humboldt penguins. The excursion ends with a visit to a Chilote family, where the traditional curanto is prepared for you; a hearty dish of seafood, meat, potatoes and vegetables, all piled high in a hole in the ground, buried and cooked among glowing embers. After a short drive to Puerto Montt, a 2hr flight takes you south to Punta Arenas. On a clear day you have views of the southern icecap, its fjords, volcanoes and glaciers. Approaching the city you see the rust brown Patagonian steppes, pitted with small lagoons, stretching out towards the Straits of Magellan. On the other side of the water rise the mountains of the windswept island of Tierra del Fuego. Punta Arenas was an important, British-influenced trading centre before the opening of the Panama Canal turned it into a backwater; the region's fortunes were only briefly revived during a short-lived gold rush. To add to its woes, the sheep-rearing business has never recovered from the catastrophic collapse of the price of meat and wool. No pure-blooded indigenous people are left alive here; having survived for centuries the rigours of the Antarctic climate they were annihilated by the diseases brought in by sailors and missionaries at the turn of the 20th century. From here continue by bus to Puerto Natales, a small town with a frontier feel on the shores of Last Hope Sound, frequented by pelicans, black-necked swans, and cormorants. An early morning departure in a private vehicle bound for the Torres del Paine National Park, with stops to visit the Milodon Cave and Salto Grande on the way. The scenery is overwhelming; the granite massif of the Cuernos, milky lakes dotted with icebergs and, soaring above, condors riding against perpetual fierce winds. For the next 3 nights you'll be based in a local walker's hostel. The accommodation is in mixed dormitories, with hot showers. Spend your days exploring the national park on foot. Follow a number of different walking trails winding alongside the glacial lakes and rivers with close-up views of tortured rock towers and needles rising 3,000m into a tempestuous sky. You may enjoy the countryside on horseback. There is something for everyone, so consult your tour leader about which hike would be best suited to you. Water and windproof clothing, as well as suitable footwear, are essential as weather can be very unpredictable. Head out across the Patagonian steppe, passing guanacos (similar to an ostrich) and flamingos, and with a view of translucent Lago Argentino, the largest lake in the country. It is on these shores that El Calafate, your next port of call, is situated. This is a small town, but it is growing fast, brimming with hotels, cafes, tour agencies, delicatessens, sweet shops and roaming travellers. There's not a huge amount to do in town, which makes for a great opportunity to unwind. It is also convenient base for excursions into the area for those that would like to book some. 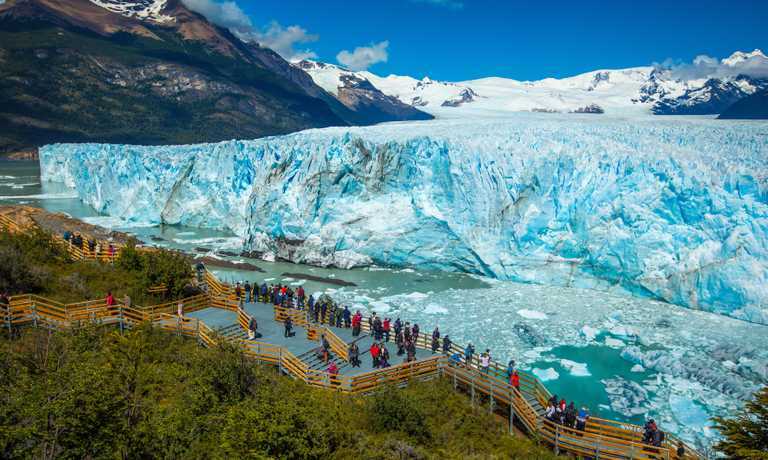 The town is a stopping off point for visitors to the Perito Moreno Glacier, still one of the most dynamic in the world. Driving out towards the glacier the road follows the lake before turning up a wooded valley, dense with beech and birch trees, and continues alongside shimmering lagoons bordered with bright crimson and heather lichens. The park authorities have been sensitive about keeping the site as natural as possible, and there are no shops or cafes within close proximity of the wooden viewing platforms, which are landscaped into the cliff. Just looking at the cliff-edge of the glacier, which towers 60m above the water surface and is an extraordinary 5km wide, is awe-inspiring in itself. But after a time you hear the unforgettable sound of the glacier calving a vast wedge of ice the size of a tower block and sending it smashing it down into the lake, where it divides and floats away as an iceberg. There is an optional mini-trek on the glacier. Walking out on the ice is an extraordinary experience; atop this immense ice sheet you feel exposed to the elements, and you can explore the craggy, desolate landscape, peering into crevasses and deep water pools, squinting against the incredible blue of the ice. It is a 1-2hr walk. Travel by road through the uninhabited wilderness to El Chalten. This small town enjoys a wonderful location, surrounded by the spectacular jagged mountains of the Fitzroy range in the Los Glaciares National Park, and is our base for 2 days. 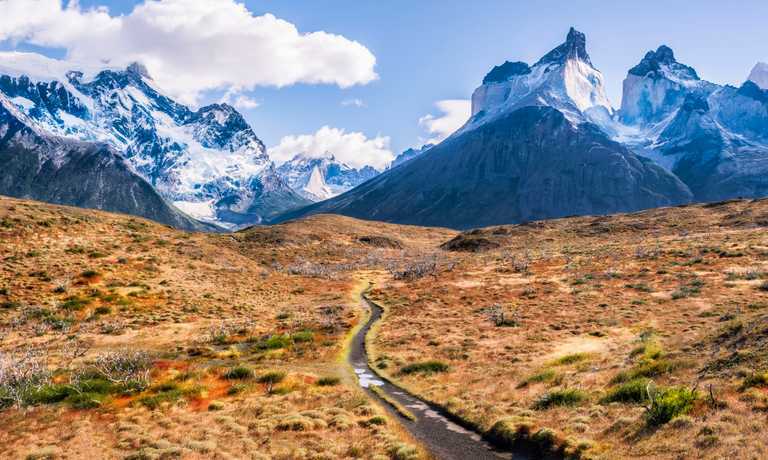 Founded in 1985 in order to settle the area and pre-empt Chilean territorial claims El Chalten has grown very rapidly as a centre for climbing and trekking in the summer and cross-country skiing in the winter. Explore this region of extraordinary natural beauty on foot, along one of the national park's many trails. You hike through dense forest and across glacial brooks with the vertical peaks of the Fitzroy Massif, too steep to shelter snow, providing a mesmeric backdrop. All walks are optional and trails are undulating but not strenuous. Be sure to take warm clothes as the weather in the south is notoriously unpredictable. An early road journey takes you back to El Calafate for the flight to Ushuaia (some domestic flights have a free baggage limit of 15kg, the excess charge is minimal though). The world's southernmost city, Ushuaia, sits at the foot of a hand of jagged peaks. Thus isolated, it was a penal colony at the turn of the 20th century and a sleepy frontier town until the late 1970s when it was turned into a tax haven to encourage settlers. Immigration has slackened off nowadays as this status is being rescinded but effects of the boom are nonetheless evident, with chalet-style residences, modern hi-tech factories, shopping malls and duty-free shops. Full-day excursion to the nearby Tierra del Fuego National Park, with its bright green deciduous beech forests cascading down to bright lakes and fjords populated by water birds and beavers. Walk along winding, narrow hillside paths to be met with views over the Beagle Channel, and learn about the flora and fauna of the area with your guides, who love the park and have devised their own nature trails. The 4-5hr walk is at a gentle pace, there are plenty of stops and a packed lunch is provided. In the afternoon, fly to the Argentine capital, Buenos Aires, an elegant and cosmopolitan city famed for the fascinating port district of La Boca with its cobbled streets and brightly painted houses. It was here that the tango was born, and Diego Maradona honed his footballing skills. The centre of the city is the historic heartland, with government buildings and churches as well as chic shopping districts, which have a nostalgic, Parisian feel. The bohemian district of San Telmo is full of quaint old houses interspersed with antique shops, tango bars and expensive restaurants. Slightly further out of town is the Recoleta district, even more evocative of belle epoque French and Italianate architecture. During the winter months, wealthy female residents parade the streets in their fur coats and improbable, towering hairstyles, and take afternoon tea in the city's ornate cafes. Explore the lanes and boulevards on your guided city tour, then make the most of some free time to shop, have a drink and a pastry in a tea-room or peruse the items on display in one of the many markets. It's fun to wander up and down the quay in the city's splendidly renovated port district, Puerto Madero, which has trendy loft apartments, a string of open air restaurants and a small marina. To take a break from the city's frenzy, you can travel by motor catamaran across the River Plate border to Colonia in Uruguay (don't forget your passport) where you can wander cobbled streets and admire the squat colonial houses from the top of the lighthouse, and have a glass of wine or lunch in the yacht club. Wherever you are on your last day, if you are an enthusiastic carnivore make sure you have a juicy steak, usually up to a quarter of the price of its UK equivalent. Finally, you could catch a tango show for a fantastic farewell to the city. Day 20: Depart for international flight or onward journey.